Using a modular UPS design can also allow for different types of scalability that you may not get from a more conventional UPS. We will explore how this set-up typically works, advantages and key considerations for a modular UPS, and show examples of some of the more common modular UPS systems in the market today. The modular UPS can be its own self-contained system. It is essentially a combination of battery and power modules that are within the same cabinet or chassis. These modules are building blocks that typically share a common frame, buss, and communicate either through either a main logic controller or, in some units, by the logic built into each module. There can be several advantages to using a modular UPS configuration. Ability to grow capacity on an as-needed basis. This type of scalability can protect user’s investments by not having to initially oversize to achieve a certain capacity. It also can reduce the total cost of Ownership (TCO) of the entire system over its life span. Hot-swappable design of modules allows faster repair time and reduced maintenance cost. This design presents a flexibility in power reconfiguration as company business requirements change. 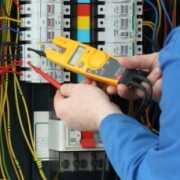 Installing, upgrading, moving, or re-configuring the system is easier to undertake. Making these operations easier ultimately saves time and money. Greater Efficiency. UPS systems run at greatest efficiency when they are close to their maximum rated capacity. When the load is less than near capacity, the efficiency of the UPS drops as well. Having plug and play modules allows one to scale capacity up or down to keep actual load demand closer to capacity, versus a larger total system that will be significantly over-sized and inefficient. Redundancy management improved. With a traditional, single module UPS designed for redundancy, load on the UPS system has to be carefully managed so that neither UPS exceeds 50% load. In a fail-over situation, each UPS needs to have adequate capacity to support the load of both UPS systems. Because of this, this type of UPS configuration can never run at ideal maximum efficiency. With a modular system that is designed for N+1 redundancy, there should always be one module installed for redundancy. This allows for a level of redundancy, while still operating at close to peak efficiency. Environment. Modular, scalable UPS systems are almost always transformerless and are not designed for rugged or harsh environments. They are built for a clean, data center type environments, this should be taken into consideration during UPS selection. Improved time to repair. Today’s modular units are well engineered, and typically enjoy high meantime between failure rates (MTBF), but in the event of a failure, a modular UPS has a significant number of components that are hotswappable, and often plug and play. This greatly decreases the amount of time that a technician may need to spend troubleshooting or replacing component level parts. Batteries. Modular UPS systems often have various options for run-time and battery configurations. Some system utilize enclosed battery modules that are comprised of dozens of smaller amp hour batteries. It is important to consider your environment when selecting a battery solution. Many units on the market today allow for larger, more robust batteries, including Lithium Ion technology. 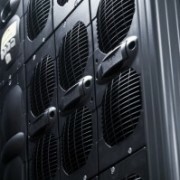 Modular UPS units have a number of factors that should be considered during selection. At QPS, we have serviced, installed and deployed hundreds of modular UPS applications, let us be your modular UPS experts; contact QPS today about your facilities needs.